Long form content is the latest fad in the world of blogging. It was around all along but never really became a hit. The vast majority of the bloggers were content with writing smaller and more numerous post on a particular topic than write one huge post. The keyword is ‘seo step by step’. The first result is this post from Neil Patel’s blog. Keep this tab open for later. Scroll down to the third page (this may vary). WPbeginner is a reputed and a older site than Neil’s. Yet, it ranks on the third page! This post is from wpbeginner, one of the oldest blogs on WordPress tutorials. This covers the introductory chapter on the topic. There is a link to the subsequent chapters that flow naturally. All the information is available in logical order. The search engines can read it, the user can understand it. Better, downloading and maintaining chapters is easier. But alternatively, check the first result out. This post does something similar. The headings are often present along with a table of contents. But the content is not divided into multiple pages and instead clubbed into one huge page. Logically, this makes little sense. There are pros and cons of this approach – from a common sensical point of view. If that’s a thing. (NEUTRAL)Downloading a single page gives you access to the entire learning material. But you can’t pick and choose chapters. Printing the whole page directly will be useless. Unless you wish to waste paper and ink. (PRO)The keyword density is likely going to be higher for multiple keywords, especially if you write the posts with them in mind. You can add more metadata and media that are both relevant and useful. (CON)It downloads the entire ‘book’ when all you need is a small chapter to brush up your memory. (CON)Modularity of the content is lost. You cannot print a subsection of the page directly without first copying the content you want separately. If permalinks to the headers are not present, linking back to relevant sub sections is just not even possible. (CON)Scrolling the entire massive page may just be unwieldy on a smaller screen. This is important as mobile first web design is now more significant than otherwise. (CON)User attention span is short. A huge content is often likely to discourage the user from going through the entire document. Users are likely to skip to the parts they feel is relevant, missing connecting strands earlier. The experience is not likely to be great. Yet, this long form content is actually what works wonders in search results. 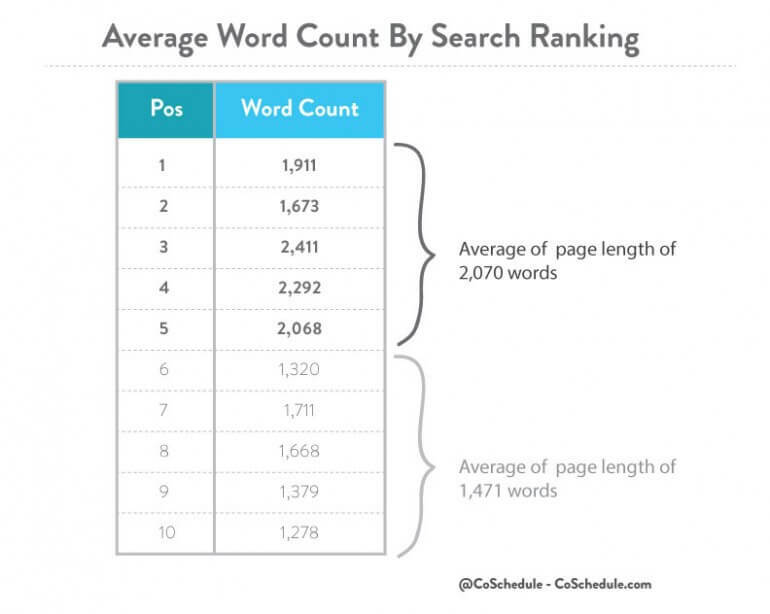 If you check out top ten random search results on any major keywords, you will find the majority of them having a word count of above 2000. Take the Neil Patel post example for a simple illustration. That post numbered well over 4000 words. Look back at the same search result. The first page has only 10 odd posts out of 18,00,00,000 results! Even then, Neil has ranked his post higher than a much older website by 2 whole pages. How many are going to travel to the third page to read the still very good guide of wpbeginner? Also look at the word count of the top first posts of the same search keyword result. Apart from exceptions, for all high value keywords (remember those 1800 million results? ), long form content will be usually at the top. Does this mean less content is useless? No. But they are less likely to be considered as relevant by Google. Why? I am genuinely not sure about the logic behind it. Apparently this goes against common sense. As a regular reader, I need short precise information or solution to my issues or questions that I raise. A huge amount of descriptive text is unnecessary. Let me explain with the below example. Take this post. It ranks ridiculously well for the following keyword ‘how to start with seo’. Let’s call this page ‘A’. This is a similar post below that ranks lower than the one above. The information that is contained in both the posts is largely similar. Let’s call this page ‘B’. What makes page A rank higher than page B? Point to note is that the word count for page A is less (much lesser) than B. The opposite is fine as well. We saw that in the first example. So Long form content helps. And there are no downsides to going with it. It is not conclusive. But we can establish two facts. The second point is crucial. Even if the former (point 1) is not be very conclusive, the second point is. I have seen this across domains and verticals. This point holds true. Since we don’t know the exact Google ranking algorithm, I cannot specify exactly what prompts a page to rank – or if long form content is THE major component. But we can establish that ranking of a page is not negatively affected by it. There are websites out there that rank extremely well with traditionally sized posts, numbering around 700 words. There are posts that rank great at less. One thing is common about them. They are already popular and have a high reputation. Let’s check the keyword ‘revist old content’. This post of Darren Rowse is at the top. It is not a huge post either. Their domain authority is ridiculously high already. This makes more sense. Google considers their content (however short) to be more valuable than those whose authority is less. So, for the vast majority of us out there, long form content is the way. This has gained notoriety as well. Though I have not come across this complaint enough so far, I have been fairly irritated by posts that are unnecessarily long. Posts that could have been around 400 words were stretched to 4000 or more. I have to actually hunt for the bold text, briefings, or sub headings to keep track and make my notes. It is obvious that Google has not yet quite figured out a crucial distinction in this case. Quality has not been given as much importance as quantity in this case. While scoring with quality is harder while using NLP or any other similar technology that Google may be using for ranking results – it needs to be done if the search results have to be relevant. In fact, with time, relevancy will increase. Here shorter and precise content seems to be better suited for the keyword. The shorter post appears more relevant than this 4000 words post of Neil that ranks for multiple keywords. But the larger post ranks higher. Here is what the Michigan University has to say about this in its post. In some countries, you may get a snippet actually showing Michigan’s post summary up at the top. This shows that Google probably is aware of this issue and is trying to fix this. Opening the link directly takes us to what was ranked at number 2! This is good. Not only is it a edu domain, but also exactly what a user would expect to know. Readers are actually humans. The bots that scrape the content are artificial. Even though Google lands you to the larger post, the user is more likely to bounce from that site to the other in a short period of time. Once the bounce rate is considered for a significant amount of time, Google is likely to revise the rank accordingly. But that takes time. Is it going to rank like that for that long? And how long? We don’t have answers to these questions. Long form content is preferable. This is not going to affect Google Search rankings in the immediate future, but to improve the user experience you must ensure that there is enough quality stuffed into a 2000+ word post. This is not easy to achieve. Typically we tend to pick a topic and write more about it. I suggest you change this technique and pick a topic and write in detail about all the sub topics about it in a single post. As mentioned above, break up your post into several sub posts. For instance, you want to write about ‘writing long form content’. Ask the following questions. When is it necessary and when is it not? What can go along with it – what kind of media goes best? What is the ideal length and what evidence do I have for it? How well does long form content fare in the social media marketing arena? How to further optimise it? What are some of the success stories? How can they be best emulated? What are the common pitfalls and things to avoid? What does Google actually say about it? What are the exceptions and what makes them so? You can go on and on, depending on your requirements. Each of the above questions can be sub headings that you highlight and keep in a table of content link in the beginning of the post for easier navigation for the user. It is easy to beat around the bush. Especially with vague descriptions and to do tips, you can extend a simple post to a mind bogging size. But that will scare your readers away. I will never visit a website that does that. So, relevance is absolutely necessary. Every sentence should serve a purpose. Whatever you write – make sure they are needed. Otherwise, mercilessly weed them out. Make sure sub headings are clear and flow logically. They are the beads that actually tie your post together. A step by step guide will help the reader keep track of the tasks to be done. Keep permalinks for each of the sub headings above, so that the Table of contents can be maintained and external sites could backlink to your sub sections with ease. This is how GitHub handles it like a pro. The regular SEO suggestions for any page is applicable over and above these tips above. Editing older posts is extremely useful. For once, you tell Google and other search engines that the content has been modified. This metric is taken into consideration while ranking. Up to date posts signify evergreen content that is relevant to this date. So open up any of your older smaller posts of before. Verify and edit the content that is already present in it. Just don’t change the url – it is ideal to preserve all your older link strength. Otherwise you will have to do a 301 or a 302 redirect to the new page to prevent your older page from giving a 404 page not found error. This has a negative effect on your SEO. Note: If you are using WordPress, a plugin to redirecting pages easily can help. Redirection helps you do that. So, first update and then add more content that is relevant. You can actually merge a number of your existing posts to one as well. You will have to redirect the urls of the pages being merged to the parent page to avoid losing the SEO benefit. If you are using WordPress, there is an easy way of doing this. Just go to this plugin and rewrite the new and old links for the pages you want merged as shown below. Test this out a number of times and clear your server caches if you have plugins of that sort on your website. This way you can do more work with less. Not only do you make a large post, but also reduce your effort. Is this worth it? More significantly, is this not a compromise? Precisely. And this is the reason, I will try my best to avoid it. The vast majority of all my posts are such that there will ALWAYS be more to write about without merging similar posts on the topic. I also keep the original links (multiple links) instead of maintaining only one. I know THIS will work better because 4 or 5 large posts are better than 1 single large post with 4 or 5 merged posts. The merging is probably useful only if you are terribly short of time and the post is not as relevant as it was before. I call this reinforcing dead posts. It may not work all the time. But it sure is better than your old posts that get no views. THIS last sentence is crucial. Also consider the proportion of posts – posts that are long form to the number of posts that are shorter. If the ratio is anything less than 10 percent, you have a serious catching up to do. Consider your blog has about 200 short posts – with okay content. Another assumption is that you are no celebrity – their domain authorities and views are over the roof anyway. You write about 10 long posts that satisfy the users. What do they do? They will either subscribe or at the very least browse through a few pages. As soon as they come across posts that are suddenly a tenth of the size of the comprehensive one that actually got them to subscribe or browse – how do you think they will react? You will be lucky if they keep you in mind. It is important to have a consistent page structure. The expectations that you set for a user should be maintained. Otherwise you will suffer views. And this is something that you can fix rather easily. This appears to be a corollary to the previous points mentioned. But let me reiterate with one of the best blogs on backlinks out there. Yes, I am talking about backlinko. Check out their blogging calendar. Another king of long form content in the field of SEO. Their motto is simple. Less new posts. More quality updates and content. How many posts do they have? Check out their blog. Not many. Not nearly enough, you would think. But they rank in the first page for the backlink related keywords organically. All you have to do is just read one of their posts. The length of the post, the quality and the way it engages the user is amazing. That is what you should aspire to. This simple call to action on your part will automatically trigger a number of cascading positive effects. For instance, you will immediately write longer posts ensuring proper quality and care much less about writing frequently. In case of any change, you just need to update the older post instead of writing a new one. As your domain and page ages, even that will have a positive effect – especially if you make the effort to keep it up to date. I, for instance, will need to update this page significantly. Though the page is still relevant for bloggers who DO NOT write long form content, I am not sure how far it works. At the very least, the reduced efficacy of the technique must be pointed out to the readers. A lengthy descriptive content does well in search. There are other factors at play as well. Quality of the post is doubly important. Formatting the text properly is crucial. Break down parts of the post into subsections that readers can easily consume. Keep permalinks that other posts of your blog and even external links can link to. Post frequency is also no longer an essential component. It helps. But you can do without it IF your existing posts are beyond amazing in the first place.